I LOVE this book! 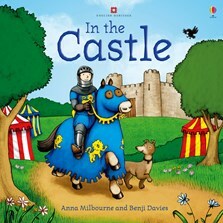 We started reading In The Castle to our 2 year old son several months ago every night before bed. He now has all of the words memorized and reads the book along with us! We love the pictures and he studies each page carefully to find something new each time. This book is perfect for little boys!